Every so often we have a line up of planets that enter into a retrograde mode at the same time. Our subconscious mind is much more powerful than our conscious mind and drives and directs more of our behavior, personality, and dreams than we realize. 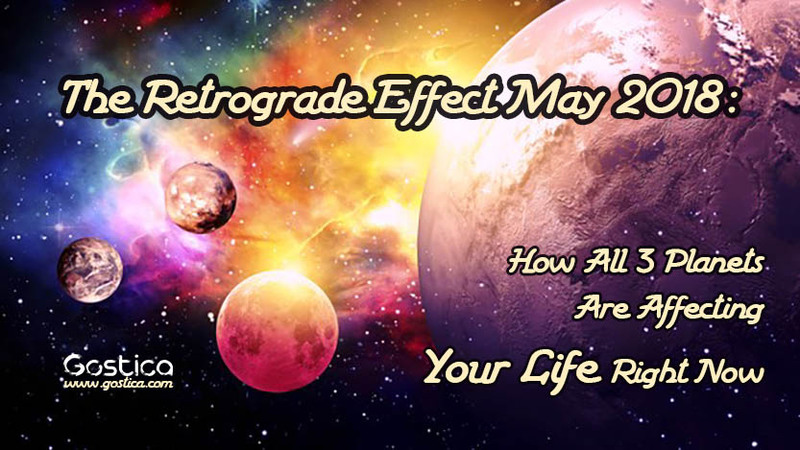 Retrograde energy is also highly feminine and in these patriarchal times, on a subconscious level, many of us struggle to accept and integrate feminine energy into our everyday lives. In May 2018, a total of 3 planets will be retrograde including- Saturn, Jupiter, and Pluto. These planets each have their own retrograde cycle, however, the combination of their energy in May, in particular, is likely to be significant. We, of course, need masculine energy as it helps us survive, thrive and get things done, but we also need feminine energy. As a society, however, masculine and feminine energies are very much out of balance, and so when the planets start operating in a retrograde motion, we really feel the effects. Jupiter: Jupiter retrograde is helping us to re-evaluate our goals and to think about why we are doing what we are doing. Jupiter retrograde also helps you to go back to old projects with new ideas. Jupiter retrograde is a time to find success by doing things differently and following your intuition. Jupiter is retrograde until July 10, 2018. Saturn: Saturn retrograde will be guiding us to step up and take responsibility for the choices we have made. Saturn will be asking us to claim back our power and will help us to uncover subconscious blocks or patterns that are holding us back. Saturn will go directly on September 05, 2018. Pluto: Pluto retrograde will be guiding us to really uncover the skeletons hidden in our closet. Pluto will also be guiding us to make changes and to transform our lives to a new level of power. Pluto works on such a deep, subconscious level that we are likely to not even understand or comprehend the influence of Pluto. Pluto moves direct on September 30, 2018. As a general rule of thumb, when planets furthest from the Sun-like, Jupiter, Saturn and Pluto go retrograde we are likely not to feel it as much. This is because these planets are already operating on a subconscious level most of the time. However, with the latest full moon transition, we are feeling everything 100x more intensely than we normally would. When any planet goes retrograde, it is generally a time of self-reflection and to explore the deeper and more profound thoughts of the subconscious mind. Activities like journaling, spending time in nature and creative projects are great ways to make use of this retrograde time.